Click to download a printable road trip checklist. Getting ready for a road trip can be hectic, but using a checklist is a great way to help make sure your preparation efforts go smoothly. 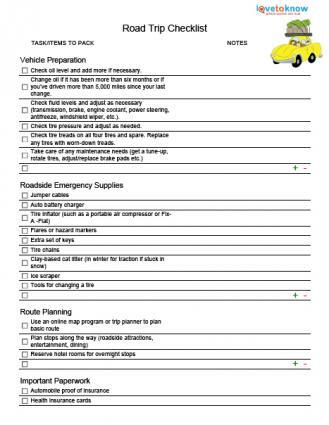 This printable checklist can help you organize what you need to do and pack for your road trip to get you on your way. Each category allows you to add your own items to the checklist. To add the items, click the plus sign (+) on the right-hand side of the bottom item of the category. Click your cursor in the new field created and type your list item. To eliminate an item you have created, click the minus sign (-) at the end of the column you'd like to delete. When your list is ready, click File-Save As and save your checklist. Print your checklist when you are ready for use. Before you head out on the road, you'll need to do a little bit of planning for the trip. Planning includes setting a financial and time budget, mapping a route, and preparing for other aspects of the trip that may arise. A few weeks to a few days before you leave on your road trip, you should prepare your vehicle to ensure it is in sound mechanical shape and prepared for emergencies. Just before taking off, you should double check important items like oil levels, wiper fluid, and tire pressure. Packing varies from person to person. Whether you need to pack for kids or just for yourself, you don't want to forget anything. Try this vacation packing checklist to make sure you bring everything you need. Being well-prepared for your trip can help increase your enjoyment by reassuring you that once you're on the road, you'll be prepared for most contingencies. By planning well, you can sit back and enjoy your trip.